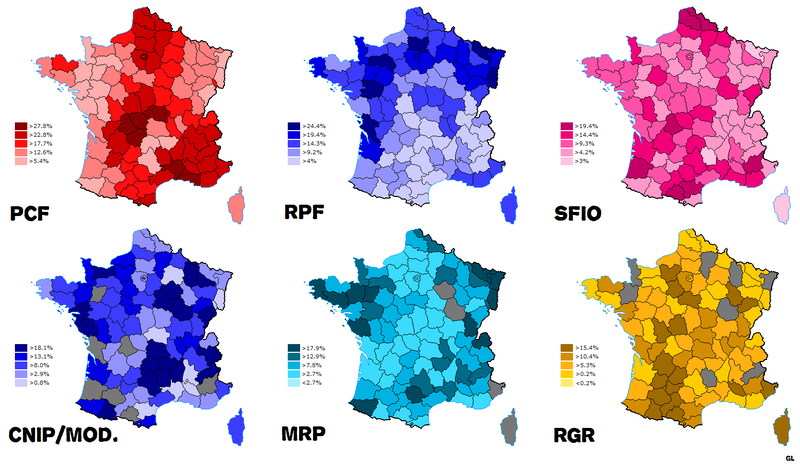 In my past post, I looked at the changing face of the French left in terms of its social and geographical bases between the 1995 and 2007 elections. In this post, I shift to something completely different and something far removed from modern French politics, upon request of one reader. The Fourth Republic, between 1946 and 1958, is usually associated with political instability and a political regime based on the institutional preeminence of the legislative branch at the expense of the executive. Unlike the Fifth Republic, whose structure of government as expressed by the Constitution of 1958 was plebiscited by over 80% of voters, the Fourth Republic was contested from its birth – its constitution had only been approved by 53% of voters. Charles de Gaulle, most significantly, opposed the Fourth Republic from the outset. Favouring a strong executive and a weaker legislature, he also criticized the ‘partitocracy’ of the system which placed party interests above national interests. The political system of the Fourth Republic, at least until 1955, quickly stabilized by 1947 around three main parties which formed the Troisième Force (or Third Force). In May 1947, in the context of Cold War tensions and following a revolutionary strike wave notably in the Nord’s mining basin, Paul Ramadier excluded the Communist ministers from his cabinet, and the PCF would from then on remain shut out of cabinets until 1981. Following the collapse of the tripartisme (1945-1947) allying Communists, Socialists and Christian democrats, the new government coalition crystallized around the moderate parties of the centre: the Socialist (SFIO), Christian democrats (MRP), Radicals and ‘moderates’ (right-wingers). The MRP and SFIO in particular disagreed over issues such as private education, but to varying extents all these parties were attached to the parliamentary regime. Furthermore, less so in the SFIO and MRP’s case, but especially so in the case of the moderates and Radicals, they were predominantly partis de notables as opposed to partis de masse with a strong base of activists, reliant instead on its personalities and the effects of personality. Charles de Gaulle had failed to spark a popular movement which would force the parties to call him back following his resignation in January 1946, and his discours de Bayeux had failed in its attempts to influence the debates which led to the drafting of the second constitutional draft and ultimately the Fourth Republic’s constitution in October 1946. In April 1947, seeking to get back into the political game, de Gaulle formed the Rally of the French People (RPF). Presented as a popular movement which was neither left-wing nor right-wing, the RPF was an anti-system, anti-communist and nationalist party. The RPF’s leadership was recruited from a wide horizon: old nationalists, Catholics, Radicals and left-wingers. While saying that the RPF is right-wing is certainly not wrong, especially in light of its electoral base, it can be set apart from the other two main centre-right parties of the era, the MRP and the moderates/CNIP. In contrast to the pro-European MRP, the RPF was more nationalistic and Eurosceptic. It placed great emphasis on defending the independence and greatness of France and opposed the European federalism of the MRP. And in contrast to the liberal moderates, the RPF was more weary of economic liberalism and promoted a more statist economic agenda and supported a third way between capitalism and socialism. The MRP and especially the moderates were the avatars of the Orleanist tradition: internationalist, more economically liberal (less so in the MRP’s case) and ‘elitist’ to an extent that they placed less emphasis on “the nation” or “the movement”. The RPF, on the other hand, were the heirs of the Bonapartist tradition: nationalist in that they defended the independence and greatness of France, wary of economic liberalism and more statist, and finally populist in an emphasis on concepts such as the “people”, the “nation” and “movements” (over “parties”). The RPF had an immediate success in the October 1947 municipal elections in which they won 35% of the votes and conquered cities such as Paris (the presidency of the municipal council, the city not having an elected mayor until 1977), Marseille, Lille, Bordeaux, Strasbourg and Rennes. As late as the 1949 cantonal elections (delayed by the government), the RPF obtained a second resounding success with 32% of the votes. But progressively between 1947 and the 1951 elections, the RPF’s star started to fade. Part of its failure can be laid on the hostility of the print media and the official boycott on the behalf of the state-controlled media. But in the fall of 1947, the Third Force government and its Socialist interior minister Jules Moch was particularly successful in its handling (repression) of the strike wave which had begun earlier that year. As the threat of communism began to fade as order was restored in France, the conservative milieus no longer saw the need for le recours à de Gaulle (resorting to de Gaulle). The situation of chaos, foreign disasters and of serious threats to the established order which had sparked the Gaullist return in May 1958 were just not present between 1947 and 1951 when the economy started stabilizing and recovering from the war and when the main threat to the state (the PCF) started to fade out slightly in its political power. Yet, the RPF, just like the equally anti-system PCF (unlike the RPF, the PCF was not opposed to the institutions per se but to the political makeup of the government), represented a serious threat to the regime’s already shaky political stability. With over half of the votes between them, if the 1951 elections were held under the same proportional (highest average) method as in 1946, the PCF and RPF with perhaps over half of the seats would kill the regime’s political stability. The Third Force parties, hostile both to the PCF and the RPF, saw the need to toy with the electoral law as to prevent this doomsday scenario from occuring in 1951. The result was the loi des apparentements. Outside the Seine and Seine-et-Oise where highest average PR remained in use, the new system was based on highest remainders PR but with a big caveat. Party lists could “parent” themselves to another list, and if the sum total of all these ‘parented’ lists was over 50% of the votes cast, said lists would split the entirety of the seats amongst themselves. For example, even if in a constituency the RPF came first with 30% and the PCF won 15%, but the sum total of the allied Third Force parties was above 50%, all seats would go to the Third Force parties and deprive the RPF, despite polling 30%, of any seats. The result was a success for the Third Force parties. With 25.9% and 21.7% respectively, the PCF and RPF became the two largest parties. Amongst themselves, they won 104 and 120 seats. The SFIO won 14.5% (it had won 17.9% in 1946) and 103 seats. The MRP, which had won 26% in 1946, was a victim of the RPF’s success and won only 12.5% and 96 seats. The moderates, however, with 14% did slightly better than in 1946 (13%) and won 98 seats. The Radicals and their allies in the RGR won 10%, down 2%, and 92 seats (76 Radicals). Overall, the anti-system forces weighed 47.6% of the votes but only 35.7% of the seats. The Third Force held its majority with some 62% for all parties which traditionally made up the Third Force. However, the balance of power shifted to the right. For that reason and another question, the SFIO was excluded from all cabinets formed in this legislature. It was the MRP, moderates and Radicals who would form the bases of governments in this legislature. Eventually, the RPF would collapse during the course of the legislature. The counter-performance of the party in the 1951 elections, in which it had hoped to win 200 seats, was a serious hit. Then the authoritarian leadership of the party by de Gaulle who refused any contacts with the other parties led to a series of splits, the first in 1952 when 27 RPF deputies voted in favour of Antoine Pinay. As the General said, a lot of the RPF deputies abandoned ship “to go to the soup”. By 1956, the trumpets of the anti-system crusade were taken up by the far-right Poujadist movement. Perhaps 1951 does not offer us a “classic” view of the MRP, PCF, SFIO and Radicals at their strongest points (1946), but it is still interesting with the factor of the RPF and the first emergence of “electoral Gaullism”. Before going any further, it is important to point out that while these were proportional elections (albeit vandalized), in some departments, particularly ones with few seats, the results might not be reflective of the ‘real’ political sentiment of the region. The role of other factors such as local candidates, party lists and alliances, strong local party grassroots and so forth all fudge the picture a bit. But in departments with lots of seats, the political competition was along the classical lines of political parties rather than local candidates and party alliances. Sometimes, as a result of such party alliances, it is difficult to classify party lists in one department under either one of the major categories: there were a few RPF-CNIP coalitions, lots of MRP-CNIP coalitions and at least one common left-wing slate with the PCF (apparently) in Lozère. I do not have primary source results, but in some cases I wouldn’t be surprised if a party was split between two lists… Therefore, on party vote maps, there is due to be some difference on how one list is shown. The first basic map is that of the overall results, by lists, by department. These are maps replicated from a scanned copy of an old book which was sent to me by email. The second map, from which we can develop an analysis, shows results by list by canton. This map was established using my metropolitan cantonal base map by a friend mine who was kind enough to allow me to use his monumental creations on this website. The colour schemes might be a little difficult to read, especially to differentiate between the PCF and SFIO, but it is a beautiful patchwork of colours and tells more than the random mish-mash of colours would otherwise indicate. The most basic striking pattern on this map – and in fact of all French election maps starting after the end of the war until at least the realignments of the 1980s – is the pattern of left wing support, in this case PCF support, forming a sort of C or G shape. The C starts around Fréjus or Nice, circles around the Riviera to the Spanish border and circles upwards through the Tarn, Gers, Lot-et-Garonne, Dordogne, Limousin (especially Haute-Vienne), Berry and finishes in the Bourbonnais and Nivernais. In some cases, it extended into a G shape with a tail reaching upwards from Aix and Toulon to include the lower Prealps, the Diois, Baronnies (in the Drôme) and often Isère. The C or G left enclosed the devoutly Catholic plateaus of the southern Massif Central in the Aveyron, Cantal and Lozère. The main common point between the diverse regions included in this C are their anti-clericalism. This is 1951, when religious practice was still the most important determinant of voting behaviour and the variable which trumped all other variables. The PCF had a clear correlation with religious practice: a clear negative correlation as opposed to the MRP’s strong positive correlation. Basically no Communist voter in 1951 went to church weekly and only a handful could be seen as even remotely church-going. With a few major exceptions (the so-called écharpe bleue), Provence, the old southwest, Limousin, Berry and the Bourbonnais were all some of the most anti-clerical or non-religious areas in France. These are, by consequence in a way, where the tradition of left-republicanism was best implanted and where the social structure was the most “democratic” because of the quasi-null influence of the clergy. There are a handful of small, isolated industrial centres all along this left-wing C/G, and in fact those small industrial centres were the PCF’s strongholds. You found old mining (tin if I remember correctly) in the Var’s backcountry, the mining basin of the Cévennes around Alès, Sète’s harbour, textiles in Lavelanet, the mining basin of Carmaux, the mining basin of Decazeville, the industrial valleys of Aurillac, the mining basin of the Brivadois, glove-makers in Saint-Junien, the mines of Commentry, the light industry of Montluçon, ceramics and machinery in Vierzon and the mining basin of La Machine/Decize. There were industrial centres of varying size in the Ardèche (Le Cheylard etc), Isère (both mining basins such as La Mure, Grenoble’s urban working-class hinterland, metallurgy in the Vallée du Grésivaudan, textile in Nord-Isère), Loire and Rhône. But in fact the most striking aspect of the PCF’s evolution between the interwar era (1936) and the post-war years (1946) is its conquest of rural France. In 1936, with the exception of the Lot-et-Garonne (caused by local circumstances and leadership), the PCF was an exclusively urban party with its strongholds in the urbanized working-class regions of France such as the Nord or the Seine department. After the war, the PCF expanded to become a truly national parties with the implantation of the party in formerly Socialist rural areas in the Berry, Bourbonnais, Limousin, Languedoc and Provence. In some cases, some of these rural strongholds would become even more solid than some of the urban strongholds. The PCF’s role in the resistance during the War played an important role, and there is a pretty strong correlation between Communist-voting rural areas and zones of heavy FTP (the PCF’s resistance grouping) activity during the War. This is especially true in the Trégor and Haute-Cornouaille in Brittany, the ‘Red Belt’ of an otherwise right-wing stronghold. The specific nature of these Communist-voting rural areas, which make up the bulk of the left-wing C/G on the map, are pretty different from one another. They all tend to have anti-clericalism in common, but the local socio-economic realities differed. In the Var, the old tradition of the Var rouge, an anti-clerical and strongly left-republican tradition based in the patchwork of ouvriers, small employees and small shopkeepers in the Provencal backcountry was still vibrant. Similar traditions extended into Provence, but also the old republican strongholds of the Diois and Baronnies (Drôme) and the Protestant locales of the Ardèche. In the Hérault (and parts of the rest of Languedoc, notably the Gard), a similarly militant left-republican tradition was strongly implanted, but this time in the context of a community of poor, small (often very small) wine producers faced with a string of economic disadvantages and with a militant tradition exemplified by the 1907 wine producers’ revolt in the Languedoc. Limousin has a long tradition of left-republicanism and socialism, the result of small landholders, anti-clericalism and the region’s masons who worked in Paris and brought back an early tradition of socialism. During the War, FTP activity was quite heavy in the region. The other major bloc of Communist strength in this period was northern France, a region taking in the Parisian basin and besides that parts of the Seine-Maritime, Picardy and the Nord-Pas-de-Calais. The Seine and Seine-et-Oise with the mythical ceinture rouge was the original base of PCF support in France. Though 1936 was perhaps the peak of the PCF’s strength in the Parisian basin, the 1950s were still part of the PCF’s heyday. 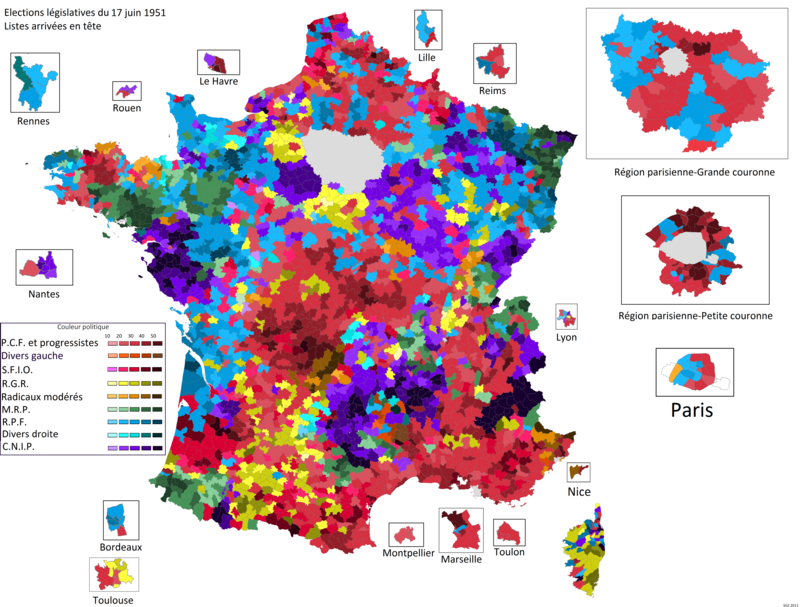 The PCF vote was not limited, like it is today, to a handful of well-maintained strongholds in decrepit suburbs, but was rather universally spread throughout most of the region excepting the then-rural outer reaches and the old bourgeois heartlands of western Paris. Outside the Parisian basin, similar heavy concentrations of low-income working-class voters could be seen in Le Havre, the Seine industrial valley south of Rouen, Dieppe, Amiens, Calais, Dunkerque, Lille (alongside Roubaix, Tourcoing, Armentières, Seclin, Haubourdin), Douai, Cambrai, Maubeuge, the mining basin of the Nord and Charleville-Mézières. Industry was also concentrated into smaller centres such as Creil, Clermont, Ault, Boves, Amiens, Boulogne-sur-Mer, Saint-Quentin and Soissons. The post-war era was the heyday of the left with the working-class. Revolutionary aspirations were not some distant pipe dreams. Being an ouvrier was a vision of society organized around the ideas of the class struggle, and being an ouvrier was regarded as being the industrial brass and steel of the country, not an archaic anachronism as it is today. The left represented, for these people (but they must not be taken as one – 3 in 10 did not vote for the left!) This was the génération héroique of workers, witnesses to the social struggles of 1936, the Matignon Accords, the Resistance and the victory of 1945. In some cases, especially in the Parisian hinterland, these voters had a solid class culture. The PCF was more than a party you voted for out of spite, it was the political expression of something. The trade union (often the then-communist CGT) was just as important. The rural element is not the dominant element in northern France, which is far more marked for its industrial activity. But in terms of the two most important factors in voting patterns in rural France in 1951, this region was anti-clerical (with exceptions such as Flanders) and in terms of land exploitation the dominant form was neither sharecropping nor direct exploitation by the owner (which often indicates smallholders), but rather fermage where a wealthy landowner owning lots of land (often a bourgeois living in an urban setting) leased parts of his land to a farmer who paid the landowner a set lease. As André Siegfried pointed out in his analysis of the Caux and Vexin, where fermage was dominant, the farmer in practice took the role of the powerful rural-based landowner with a capitalist interest in wealth rather than land ownership. In turn, he often employed a large number of agricultural labourers. But in political terms, unlike the noble landowner (the French caciques!) of the Anjou, the political ascendancy of the farmer was quasi-null. Gone was the patriarchal linkage between noble and his working hands, replaced instead by a tenuous link between two individuals who did not know each other closely. Siegfried had again proved prophetic in his predictions when he said that a day would come where socialism could develop in these environments! Ouvriers agricoles (agricultural labourers) are important throughout Picardy and parts of the Pas-de-Calais, but it is doubtful whether this was extremely relevant even in 1951. The furthest back I have census data for, 1968, indicates that the dominant social grouping throughout Picardy and especially places like the Aisne or Oise were ouvriers (manual workers). A category which, it is true, includes agricultural labourers, but which mostly includes manual skilled and unskilled workers in industry. The correlation between a high proportion of ouvriers and a high PCF vote is pretty positive in this era, while those cantons which were marked by a higher percentage of either employees or agriculteurs exploitants (those, basically, who directly exploit the land) were far less likely to vote PCF. There were quite a lot of small industrial islands sparkled throughout the Oise, Somme and the Pays de Caux. It is perhaps there where we must find the sources of PCF support outside the core urban centres. Looking closer at the above map, we can clearly see outlined the mining basin of the Nord and Pas-de-Calais, forming some sort of crescent moon from Auchel (Pas-de-Calais) to the Belgian border (Nord). The mining basin, a revolutionary hotbed in places, had been the birthplace of French socialism in the 1880s (with Jules Guesde’s Marxist POF) and in the 1920s it had been one of the earliest bases of the PCF. To this day, parts of the mining basin retain their Communist orientations. While much less visible on this map, it is important to differentiate the mining basin in the Nord (Douai, Valenciennes, Saint-Amand) from the mining basin in the Pas-de-Calais (Hénin, Lens, Liévin, Béthune). The former is the revolutionary hotbed and where Guesde’s POF found some of its strongest support in all of France. It has been a PCF stronghold since the 1920s. However, the Pas-de-Calais’ mining basin has been far more moderate (although we should not overstate it). Reformist independent socialism was strong in the Pas-de-Calais at the turn of the century, and in some cases for some miners, reformist socialist sufficed. By consequence, and it is very clear today, the Socialists have been stronger. Though the PCF’s influence must not be understated, far from it. The MRP, the post-war Christian democratic party, represented the first real experiment (ignoring the minor interwar PDP) at a Catholic mass party which accepted democracy and the “ideals of the Revolution”. France has never had a Catholic Party similar to Germany’s Zentrum, Belgium’s CVP or the Netherland’s KVP. The post-war MRP was the closest France came to having a Catholic mass party, but even then it was not perfect. Catholicism in France – Catholicism in this French context referring not to the bulk of officially Catholic France (90% of the country) but rather those for whom religion was important and who practiced their faith – had been associated since the Revolution with reactionary politics and was presented as the enemy of the Revolution, the republic, democracy, progress and the Republican values. Perhaps some of these associations were false, and by the 1950s it could certainly not be said that Catholicism was the enemy of democracy or of the republic. But in other cases it is true, Catholicism bred conservatism. Catholic milieus were by definition conservative in their outlook. The MRP always needed to deal with the ambiguity between a right-wing electorate, who had abandoned discredited interwar right-wingers, and a more left-wing leadership and style of governance. It has been said that the MRP was a centrist party, with right-wing voters and who governed with the left. It is not far from the truth, especially in 1951. The MRP was never really able to surmount this ambiguity between a conservative base and more social Christian leadership. After its heyday in 1945 and 1946, benefiting from a perfect storm: no Gaullist movement, a strong legitimacy as a party of the resistance, a discredited right and a stature as the largest opponent of the PCF following the May 1946 referendum; the MRP declined, victim of Gaullism and the effects on its right-wing base of governing in a centre-left manner. In 1946, the MRP had been very successful in its ability to conquer the quasi-entirety of la France catholique. Certainly its overall map in 1951 remains obviously tied to the map of Catholic France with Brittany, the inner west, Lower Normandy, the Basque Country, the southern Massif Central, Savoy, Jura, Alsace-Moselle and Flanders. But a look at the above map by canton shows a weakened MRP. Indeed, we find some solid MRP bases at the cantonal level only in Morbihan, Mayenne, Pyrénées-Atlantiques, Tarn, Loire (Georges Bidault), Haute-Savoie, Jura and Bas-Rhin. Bases which owe more, in this case, to local candidates (for example, in the Tarn, the top candidate was a former PDP deputy in office since 1919) and a strong local implantation (the MRP was very powerful, institutionally, in Alsace). The moderates (CNIP) have oft been referred to in literature as la droite laïque as opposed to the MRP as la droite catholique. Superficially this may be true, and some of the CNIP’s bases in the Champagne (Aube, Côte-d’Or, Yonne) or Centre (Eure-et-Loir) are reflective of this orientation. In reality, however, the differences between the “two rights” were quite abated. If the moderates had indeed been the party of the secular right, then surely they wouldn’t have won a landslide in Vendée, Loire-Atlantique, Lozère, Aveyron, Cantal, Haute-Loire or the Ardèche. Why, then, did they win a landslide there? The moderates being the party of notables by excellence, personality unsurprisingly trumped party ideology (if they had any) hugely. In 1951, the “schools question” (to use a Canadian term!) was a major political issue in France. The debate was about extending state funding to private education (also called l’école libre), which were in practice religious (Catholic) schools. The PCF, SFIO and Radicals opposed any such funding, while the right defended the liberté d’éducation. In September 1951, the MRP-SFIO coalition finally collapsed to the RPF’s delight on the educational question when the right associated to pass the Barangé law which extended special state funding for both public and private schools at the primary level. On the ground, the defense of the “freedom of education” was not just the preserve of the MRP, it was also defended by most of the RPF and also a lot of moderates. In the aforementioned ‘Catholic-CNIP’ departments, the top moderate figure often clearly and unambiguously defended the ‘freedom of education’. This was the case in the Ardèche, where the clergy had never solidly backed the MRP, but also the Haute-Loire, Lozère, Aveyron or Loire-Atlantique. To use the example of the Vendée, where the moderates did very well in 1951, the top candidate of the CNIP list (in fact a common CNIP-RPF list) was Armand de Baudry d’Asson. Baudry d’Asson had been one of the three co-sponsors of the Barangé law. He was also the grandson of a monarchist deputy for Les Sables until 1914. Baudry d’Asson is something of a stereotype for the Vendéen noble: Chouan ancestors, monarchist until the end and deeply conservative. In the conservative departments of the inner west or the southern Massif Central, the moderates and their visceral anti-communism combined with their positions on education made them a better fit, in fact, for the rural right-wing voter than the MRP could be. In the Hautes-Alpes, which returned only two members, the moderate’s landslide is the result of a weird broad list allying some socialists, Christian democrats and moderates and led by Finance Minister Maurice Petsche, who died later that year. The electoral geography of Gaullism – or rather of Charles de Gaulle as an individual – has always been a unique phenomenon. It may be a right-wing movement, but its map has never perfectly coincided with the traditional geographic distribution of the French right. The map below shows the distribution of the RPF’s vote in 1951 by the legislative constituencies used in 1936. The map also treats CNIP-RPF (or RPF-CNIP) lists and other heterogeneous lists as RPF lists, which might fudge matters a bit and explain the differences between this map and the map by department above (which apparently treats those weird lists differently). The most important aspect of the electoral geography of Gaullism in its traditional phase (which is basically 1951 and 1958 until 1968) is the similarities between the electoral map of Gaullism and the map of occupied France in 1941. Indeed, the bulk of Gaullist support is concentrated in what was the northern zone – France occupied by Nazi Germany (annexed in the case of Alsace-Moselle). 1951 does not yet allow for this trend to be seen perfectly, but by the 1958 and 1962 referendums or the 1965 runoff we clearly see Gaullism in full strength in occupied France but much weaker in the zone libre (administered directly by Vichy until November 1942). But already by this first map of electoral Gaullism, there is a marked difference between the old zones of occupation. The RPF’s strength follows pretty closely the demarcation line, from the Basque border at Hendaye, along the Atlantic seaboard, into Brittany, and then englobing the bulk of northern and northeastern France. The demarcation line is particularly visible in the Charente, with a weak RPF showing in the Confolentais which was on the Vichy side of the line; in the Indre, which was entirely in Vichy France; Cher, with the RPF’s strongest showings concentrated in the occupied zone; Saône-et-Loire, with the RPF performing poorly in the Bresse and Mâconais which were in Vichy France. The explanation is not that “the south were collabos”, which is obviously false. Some of the heaviest resistance in the maquis happened in the south. However, northern France suffered the traumas of German occupation as early as 1941, while southern France only came under direct German control after November 1942. It is thus likely that the occupied zone responded with more emotion and remembered with more emotions the appel du 18 juin. Furthermore, Charles de Gaulle was particularly involved in the liberation of the old occupied zone, while his personal role in the liberation of Provence and southern France was far less important. Charles de Gaulle’s northern origins (Lille) likely play a small role, but it could only account for a very small part of the explanation. The RPF and Gaullism would always have a strong base in the Catholic regions of western France and Alsace-Lorraine. The RPF was perhaps not a traditional right-wing party, but especially in these regions where the bulk of the RPF’s candidates engaged themselves in the support of private schools, the RPF was in perfect symmetry with the Catholic conservatism of the region. Part of the Gaullist movement’s strength in Alsace and Lorraine can be laid down on a long history of nationalism and patriotism in the region, which would logically be strong supporters of Gaullism. But in the Catholic regions of western France, the symmetry between the MRP and the Gaullist electorate is pretty visible. It was said that all of the major parliamentary parties, the MRP was the one which was closest to de Gaulle and the one which was the most likely to share a conception of power and state similar to Gaullism. In another sense, the MRP also had a strong ‘resistance’ element which was more Gaullist than traditionally Christian democratic. That this electorate voted RPF in 1951 and likely voted for the Gaullists after 1958 is not a surprise, far from it. The strong showings in Vendée on this map is pretty artificial, because this map counts Armand de Baudry d’Asson’s CNIP-RPF list as a RPF list and his list was far more a traditional conservative list than a purely Gaullist list. A similar comment could be made about Eure-et-Loir, where the RPF supported two incumbent moderates and whose list did particularly well. In the Loire-Atlantique, the RPF list had a strong Gaullist component (Olivier de Sesmaisons, incumbent moderate-turned-RPF deputy) but was also allied with the traditional right – two of the list’s four elected members sat with the traditional right-wing groups. 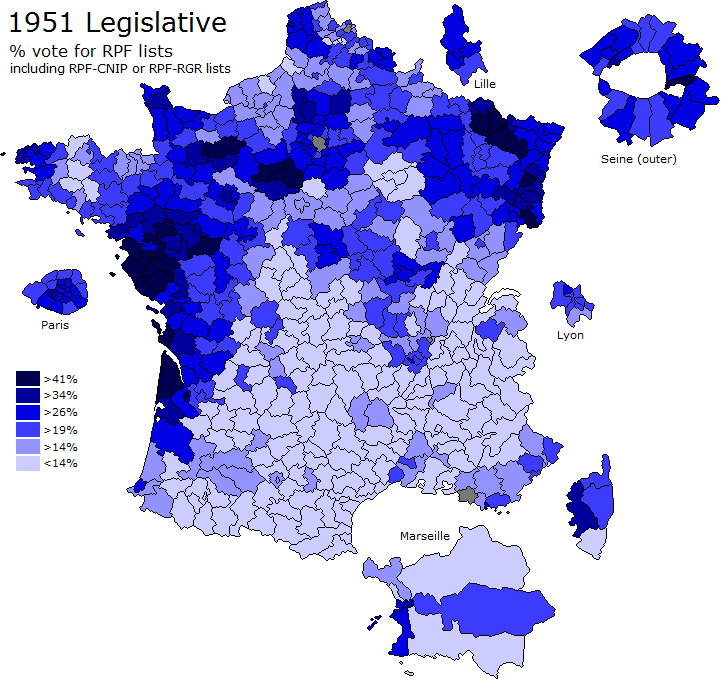 In the Maine-et-Loire, the RPF list was led by Victor Chatenay, the mayor of Angers between 1947 and 1959, and perhaps explains the RPF’s particularly strong showing. In Moselle, the RPF list was led by Raymond Mondon, the mayor of Metz between 1947 and 1970. In the Oise, finally, the RPF list was led by Jean Legendre, incumbent moderate deputy and mayor of Compiègne. His success, like that of quite a few other RPF lists, is due in good part to his personal appeal than any true Gaullist vote reservoir. 1951 is an important election in the course of French electoral history. It marked the emergence of the first anti-system movement under the Fourth Republic, and saw the first outing of electoral Gaullism – laying the bases for the future map of the Gaullist movement in its first phase. Posted on December 3, 2011, in Electoral analysis, Fourth Republic (1946-1958), Left (PS, PRG, PCF, Greens, DVG etc), Maps, Political parties and movements, Right (UMP, RPR, UDF, DL, MPF, DVD etc). Bookmark the permalink. 4 Comments.